From historic times, Waikīkī was viewed not only as a place of peace and hospitality, but of healing. There was great mana (spiritual power) in Waikīkī. Throughout the 19th century, Hawai’i’s royalty also came here to convalesce. The art of healing they practiced is known in the Islands as la‘au lapa‘au. In this practice, plants and animals from the land and sea, which are known to have healing properties, are combined with wisdom to treat the ailing. Kapaemāhu was the leader of the four and honored for his ability to cast aside carnality and care for both men and women. Kapuni was said to envelop his patients with his mana. While Kinohi was the clairvoyant diagnostician, Kahaloa— whose name means “long breath”—was said to be able to breathe life into her patients. They gained fame and popularity because they were able to cure the sick by laying their hands upon them. Before they returned to Tahiti, they asked the people to erect four large pōhaku as a permanent reminder of their visit and the cures they had accomplished. 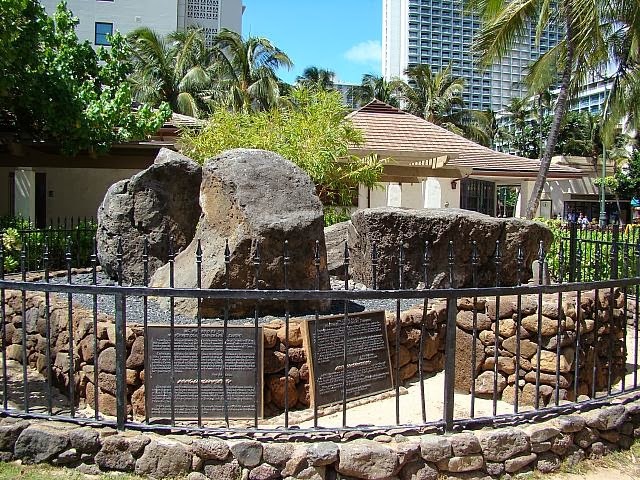 Legend says that these stones were brought into Waikīkī from Waiʻalae Avenue in Kaimuki, nearly two miles away. Waikīkī was a marshland devoid of any large stones. These stones are basaltic, the same type of stone found in Kaimukī. On the night of Kāne (the night that the moon rises at dawn,) the people began to move the rocks from Kaimukī to Kūhiō Beach. During a month-long ceremony, the healers are said to have transferred their names — Kapaemāhu, Kahaloa, Kapuni and Kinohi — and or spiritual power, to the stones. One of the pōhaku used to rest where the surf would roll onto the beach known to surfers as “Baby Queens”, the second pōhaku would be found on the ʻEwa side of ʻApuakehau Stream (site of Royal Hawaiian Hotel), and the last two pōhaku once sat above the water line fronting Ulukou (near the site of the present Moana Hotel.) In 1963, they were relocated to Kūhiō Beach. One of Waikīkī’s places of healing was the stretch of beach fronting the Halekūlani Hotel called Kawehewehe (the removal). The sick and the injured came to bathe in the kai, or waters of the sea. They might have worn a seaweed lei of limu kala and left it in the water as a symbol of the asking of forgiveness for past sins (misdeeds were believed to be a cause of illness and “kala” means to forgive.) Hawaiians still use the sea to heal their sores and other ailments, but few come to Kawehewehe. The natural sand-filled channel that runs through the reef makes it one of the best swimming areas along this stretch of ocean. It was dredged in the early-1950s to allow catamarans to come ashore at Gray’s Beach. The channel lies between two surf sites, Paradise and Number Threes. There was a Kawehewehe Pond; people with a physical ailment would come to the pond in search of healing. A kahuna, or priest, would place a lei limu kala around their neck, and instruct them to submerge themselves in the healing waters of the pond. When the lei came off and floated downstream, it was said that the afflicted ones were healed. It was for this particular ceremony that the area was called Kawehewehe, which literally means “the removal.” It was on the ʻEwa side of the Royal Hawaiian Hotel (adjacent to Helumoa), just east of the Halekulani Hotel, Waikīkī. Kawehewehe takes its meaning from the root word – wehe‖ which means to remove‖ (Pukui.) Thus, as the name implies, Kawehewehe was a traditional place where people went to be cured of all types of illnesses – both physical and spiritual – by bathing in the healing waters of the ocean. After bathing in the ocean, the person would duck under the water, releasing the lei from around his neck and letting the lei kala float out to sea. Upon turning around to return to shore, the custom is to never look back, symbolizing the oki (to sever or end) and putting an end to the illness. Leaving the lei in the ocean also symbolizes forgiveness (kala) and the leaving of anything negative behind. In the 1880s, Helumoa was inherited by Kamehameha I’s great-granddaughter, Princess Bernice Pauahi Bishop. In the last days of her battle with breast cancer, Pauahi returned to Helumoa. Although the Princess could have gone anywhere to recuperate, she chose Helumoa, for the fond memories it recalled and the tranquility it provided. Here she wrote the final codicils (amendments) of her will, in which she bequeathed her land to the Bishop Estate for the establishment of the Kamehameha Schools. The author, Robert Louis Stevenson, also found respite, here. In 1888, his health had been declining; he was told by his doctor to travel here because the climate was good for his bad health. From Kālia to Kawehewehe to Helumoa to Kūhiō Beach to Hamohamo to San Souci, there are many stories of the healing power at Waikīkī. The image shows the healing stones of Kapaemāhu. In addition, I have added other related images in a folder of like name in the Photos section on my Facebook and Google+ pages. A fascinating and beautiful recounting of the history of one of my favorite places on Earth. Bravo!